Every bride wants her special day to be perfect, and it’s my job to ensure the music at your wedding ceremony is unique, elegant, and memorable. I am available to sing at wedding ceremonies and renewal of vows celebrations in Illinois, Michigan, Indiana and Wisconsin. My role as a music coordinator is to listen to your needs and suggest music that best fits your personality and wedding theme. For more than 20 years, I have been a wedding vocalist and professional singer. My broad experience, conservatory training and musical insights have provided me with the knowledge, flexibility and sensitively needed to meet the unique demands of preparing music for wedding ceremonies. I am a full-time vocalist and music teacher and am passionate about music and the special role it often plays in people’s lives. Your wedding ceremony is just the starting point of your passionate lifetime journey together as a couple, and everything must be perfect. 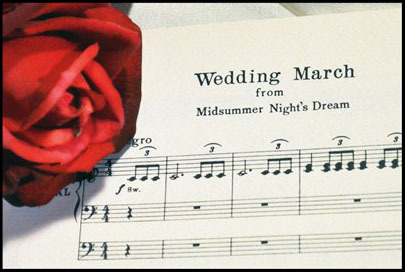 The right songs play such an important role in creating a romantic mood on your wedding day. These songs reveal your loving sentiment and become a musical expression of your love. Whether singing during the rehearsal dinner, the prelude, or the ceremony, I can suggest the perfect song or combination of songs that fit your style. I am completely at home in any venue from cathedrals to country chapels, from garden weddings to concert stages. My experience includes singing during hundreds of weddings, concerts and special occasion ceremonies. I have also been employed as a church cantor in the Catholic faith for most of my life. I can orchestrate all the musical needs for your wedding ceremony, reception dinner or cocktail hour. This could include hiring other professional musicians such as a pianist, flutist, violinist, trumpeter, or harpist. A string quartet or a trio of piano, bass and vocal could add even more elegance to your special day. I am a versatile wedding singer and my repertoire includes: traditional and contemporary wedding songs; hymns and psalms, and classical and opera selections. In addition to having a wide vocal range, I am also able to sing in Latin, Italian, German and French. The first step in picking the perfect music for your wedding is to contact me. I will make the process as stress free as possible. Contact me for availability and more information. I will be honored to be your wedding singer, and to make the music at your event memorable. What are some of the music selections that you sing at typical wedding? I pride myself on working personally with brides to select beautiful, elegant music fits perfectly with your wedding’s theme and is a reflection of your personal style and taste. To see a list of my repertoire please CLICK HERE. Will you learn a new song that is not in your current repertoire for my ceremony? I am happy to work with you to learn a new piece of music. However, please remember I am a classically trained wedding singer and do not sing like a contemporary pop singer. If I do agree to sing a new song, please be prepared to send me the sheet music two months before your ceremony. I would be delighted to sing a duet at your ceremony. I can work with a singer of your choice, or I can suggest another singer that I have performed with in the past. If you provide a singer, they must be available to rehearse 45 minutes before the ceremony. Can you arrange for other instrumental music at the event? I can provide additional musicians including a pianist, organist, string quartet, or music ensemble. Accompanying instruments could include: flute, violin, trumpet, or harp. There will be an extra charge to cover the cost of additional musicians. Are you able to perform with a music group that I have already hired? I am happy to work with any musicians you have already hired. You should provide me with their information and I will contact them directly to coordinate the rehearsal and performance details. When is it appropriate to use music during a formal church wedding? It is best to work with your church or wedding official to plan the placement and order of music. Be sure to ask if there are any music restrictions or guidelines that you need to consider. Do I need to make any special arrangements for a Catholic wedding? 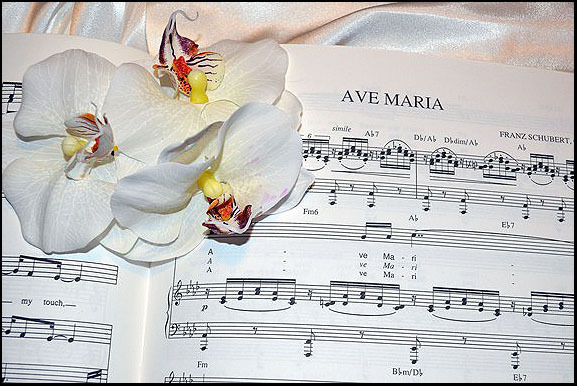 Brides planning a Catholic wedding ceremony must consult with the church’s musical director before selecting music and musicians. Some churches require that brides use their musicians and will not allow brides to bring in outside soloists. I am very familiar with Catholic wedding ceremonies and I have experience as a Catholic church cantor. Churches may also have a list of "approved" musical selections that can be used during a wedding ceremony. Will you arrange for sound equipment if it is needed? A portable piano and sound system is available for wedding music at hotels, country clubs or outdoor locations that do not have their own on-site pianos and sound systems. There will be an additional charge to provide this service. What if you are unable to sing? Will you arrange for a replacement? If any event or unavoidable circumstance prevents me from singing at your wedding - I will personally arrange for another singer to take my place to guarantee the same professional caliber of music. Please follow this link to see testimonials from some of my past clients.